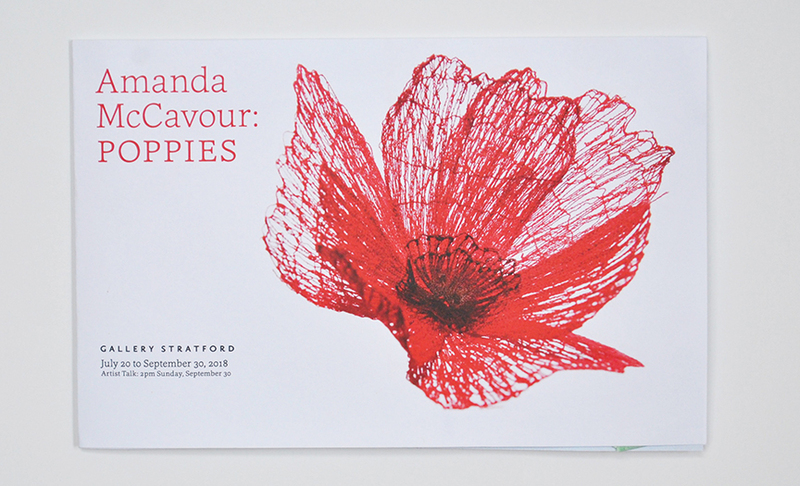 My latest exhibition “Poppies” opened at Gallery Stratford. 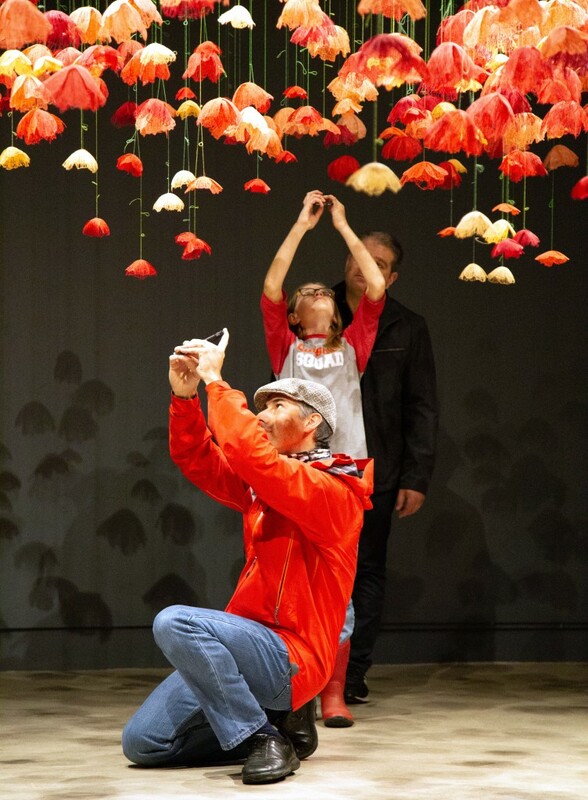 Hundreds of embroidered poppies hang upside down from the ceiling creating a dream like environment that visitors can walk under. 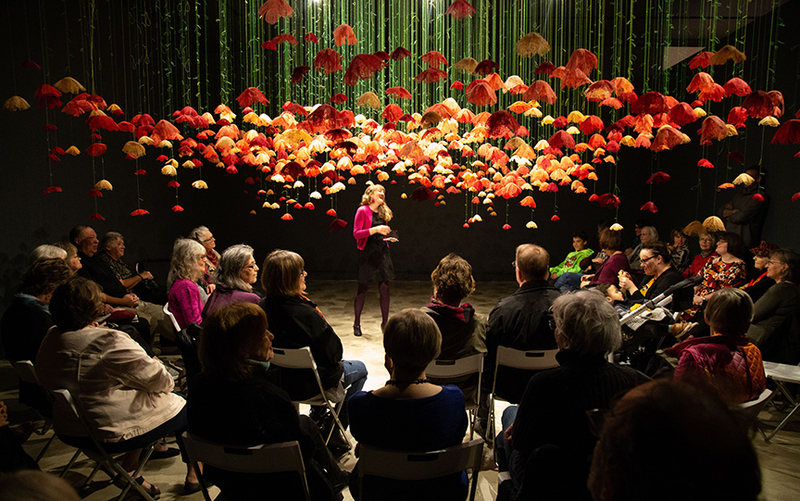 Here are images from the most recent artist talk at the gallery where we sat in chairs underneath the work, some images from the opening night and the set up of the installation. This show runs from July 20th to September 30th, 2018. “The surface used by artists that draw is referred to as ‘the ground’. The ground is stable –usually paper of some sort or other surfaces such as board or canvas – and an integral part of the drawing. But what happens when an artist does away with the ground altogether? How does this affect the perception of a drawing? To be ungrounded conjures up ideas of insubstantiality and strangeness. To be ungrounded can be unsettling. 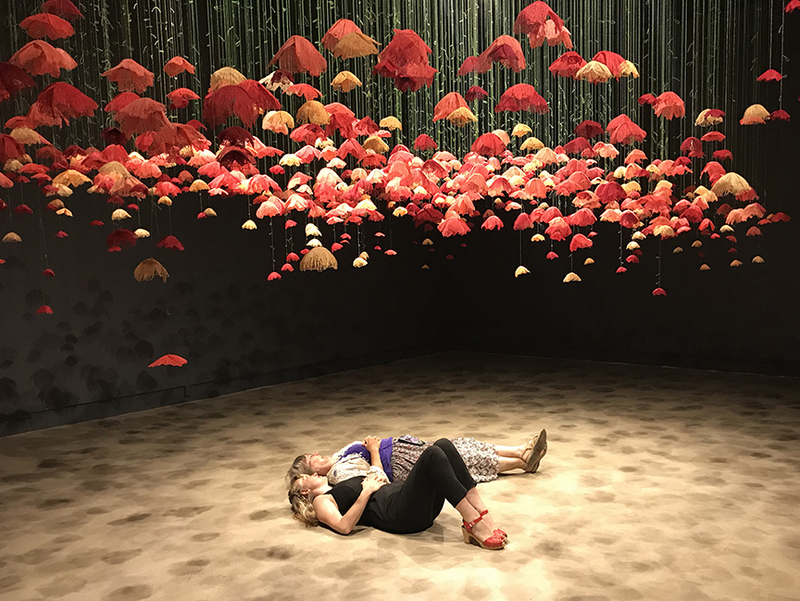 However, the installation work of Amanda McCavour inverts and contrasts these particular connotations to create immersive works, that are inviting, appealing and welcoming. Her alternative approach to drawing, choice of materials and conceptual concerns create quite the opposite effect of discomfort. Rather than utilizing the conventional tools of drawing, McCavour explores the qualities of line and form with embroidery. She draws using a sewing-machine assisted by a magical dissolving “ground,” with the eccentric name, Sulky Solvy Stabilizer®. 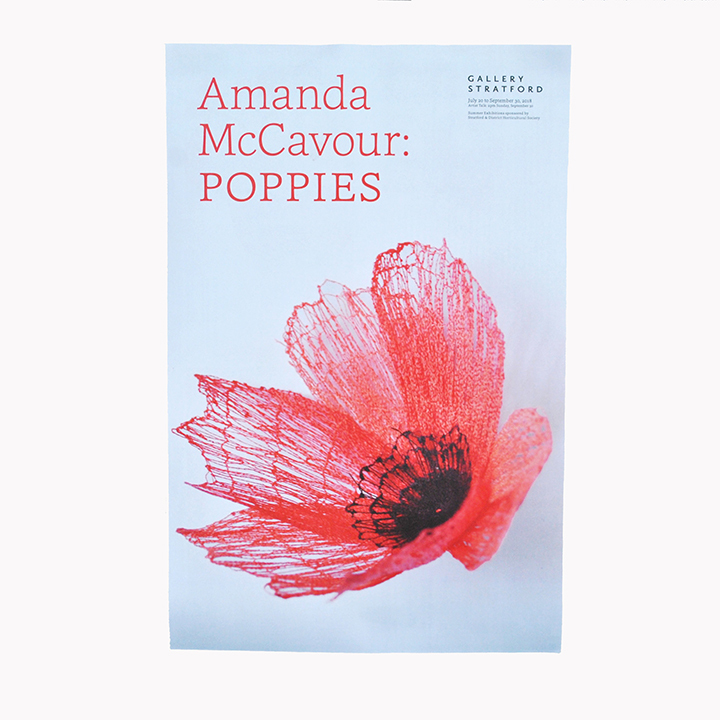 This substance permits McCavour to float her drawings off the ground; transitioning from the two dimensional plane to the three dimensional realm. 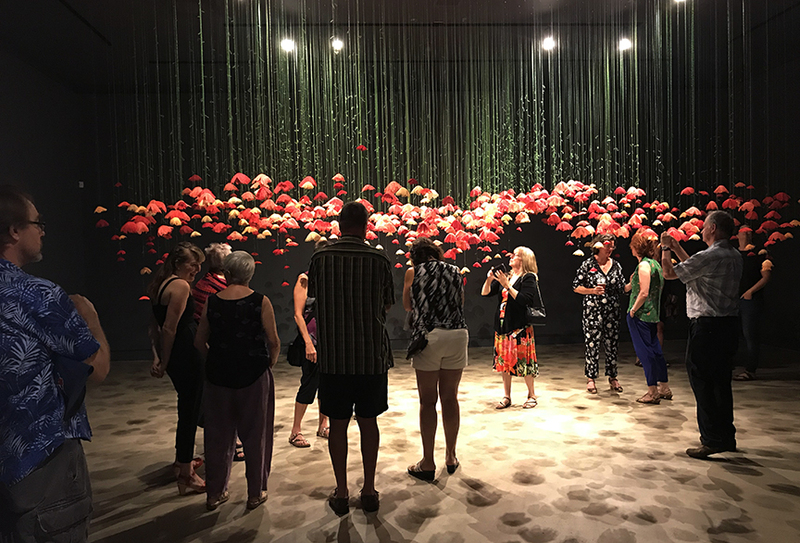 The results are veil-like drawings, layered and hung in space, evoking commonplace and familiar settings such as cozy living rooms or a beautiful garden of flowers. Embroidery, as a category of textile practice is perceived as homey and decorative. McCavour is conscious of these implications and her conceptual objectives explore these views. 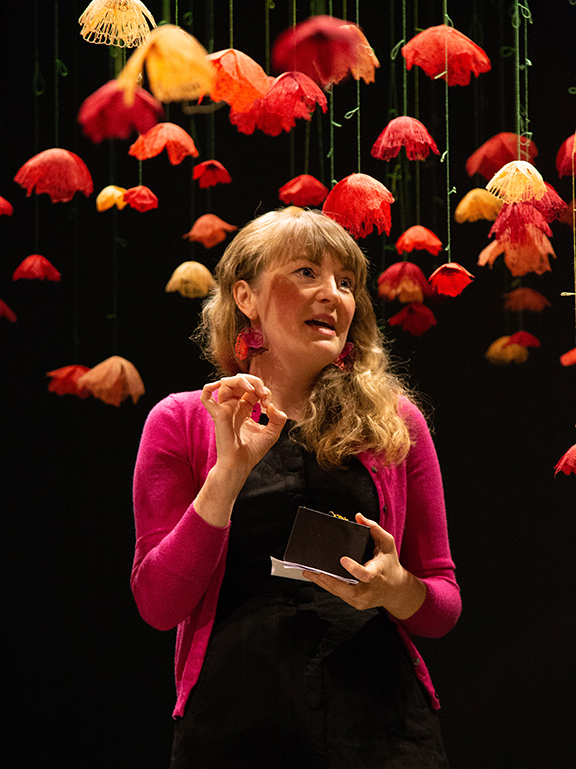 She is also interested in dichotomies; the contrast between fragility and strength; the play between negative and positive space, and how embroidery can express these dualisms. 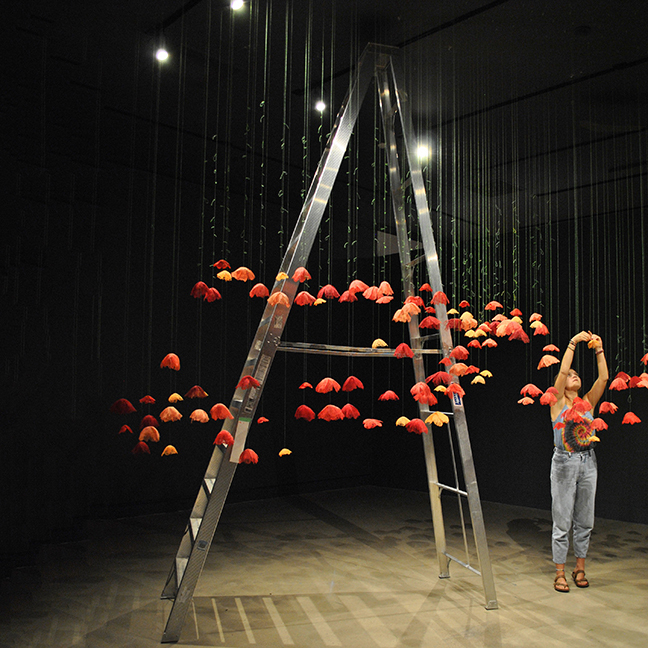 Her installations depict domestic scenes, figurative gestures, favourite potted plants or fields of flowers. 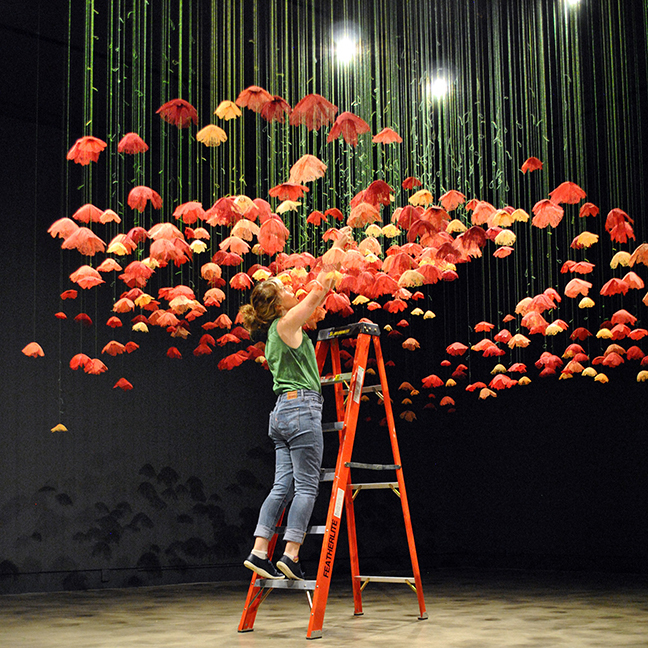 McCavour creates multi-networks of thread that emphasize both solid and ethereal correlations within the installation. 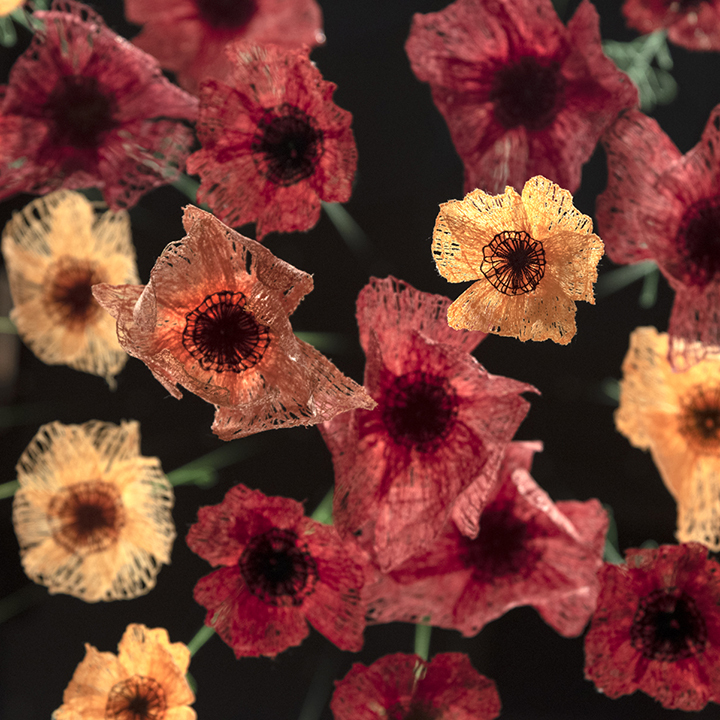 A single filament may be tenuous but the additive process of machine-embroidery builds up lines; fortifies connections to create imagery redolent with absence and presence; depth and dimension. 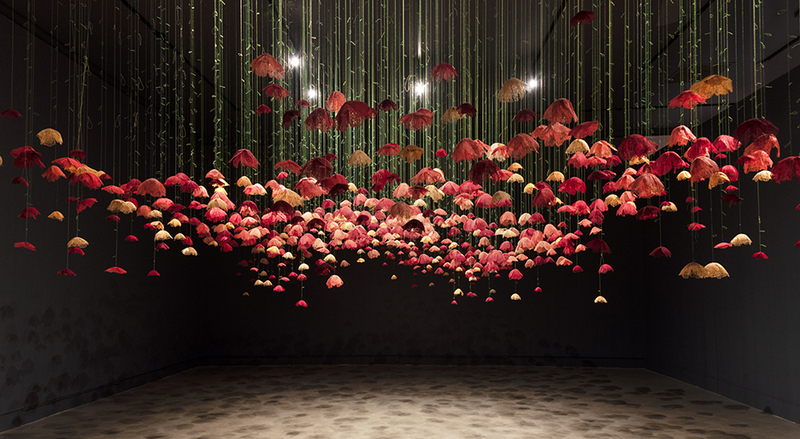 McCavour uses other textile references as well, to guide the positioning and structure of her installations. 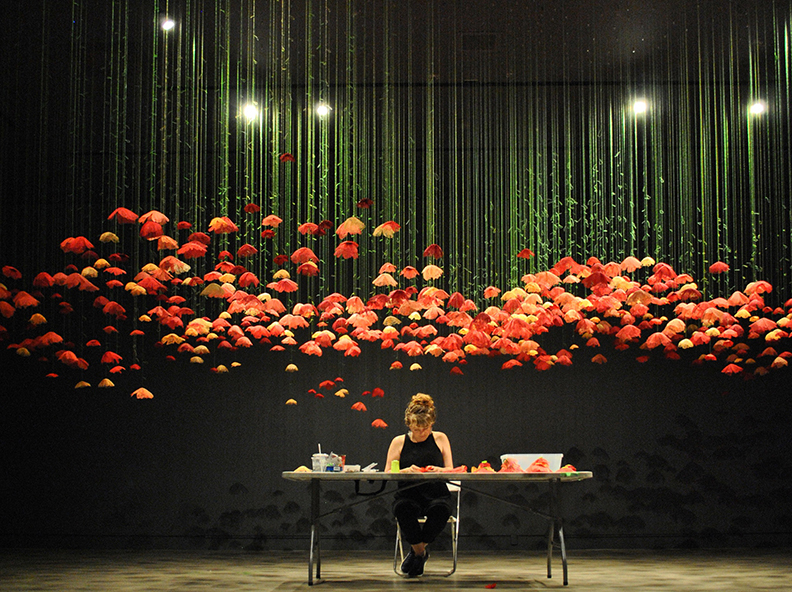 Her current installation, Poppies, suggests the repeat patterning on floral fabrics or wallpapers. 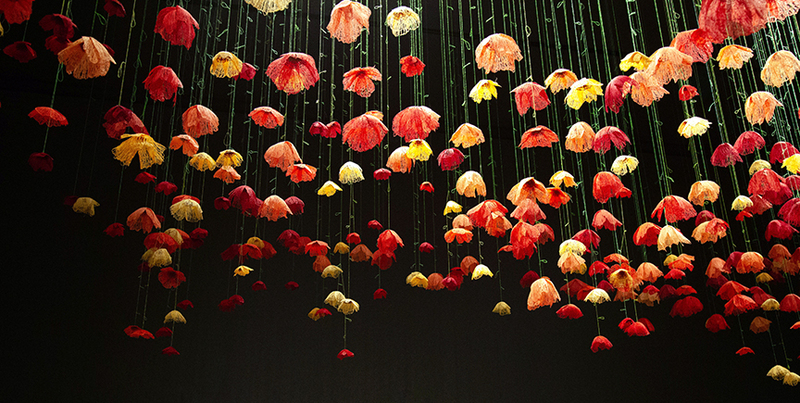 Poppies, is an upside-down field of over five hundred delicate pink and red flowers suspended from the ceiling. 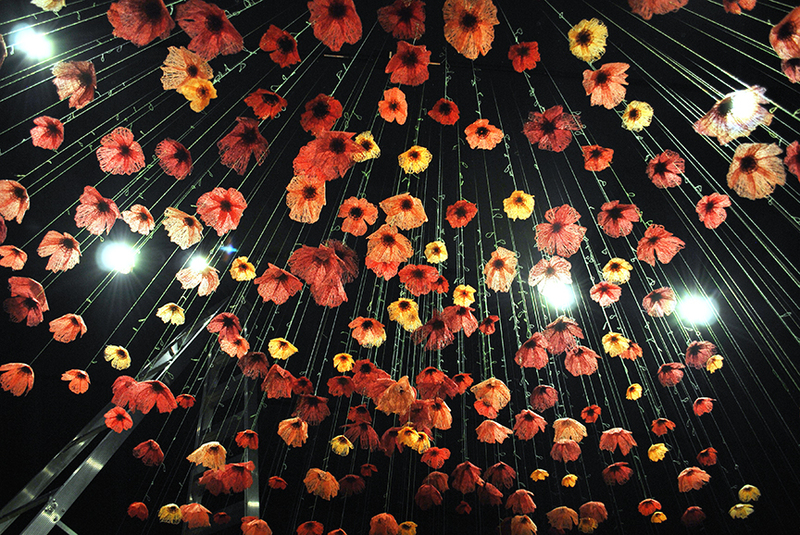 This field of poppies is not quite as it should be – not conventionally planted in the earth. 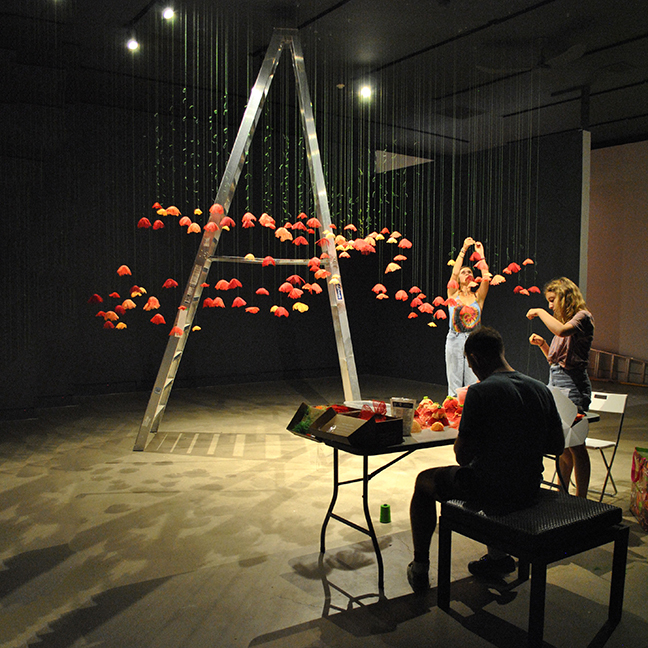 The installation is both enigmatic and appealing. 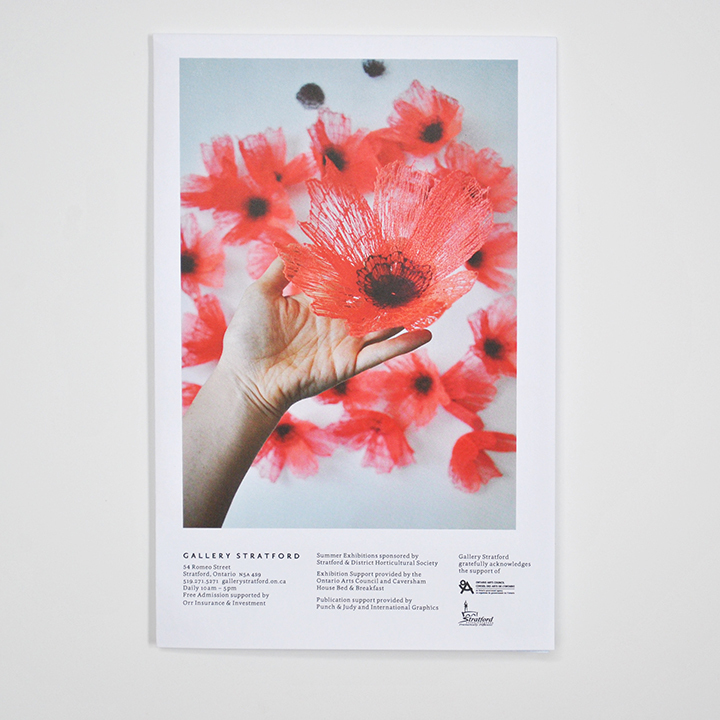 The poppy is an emblematic flower with many associations. 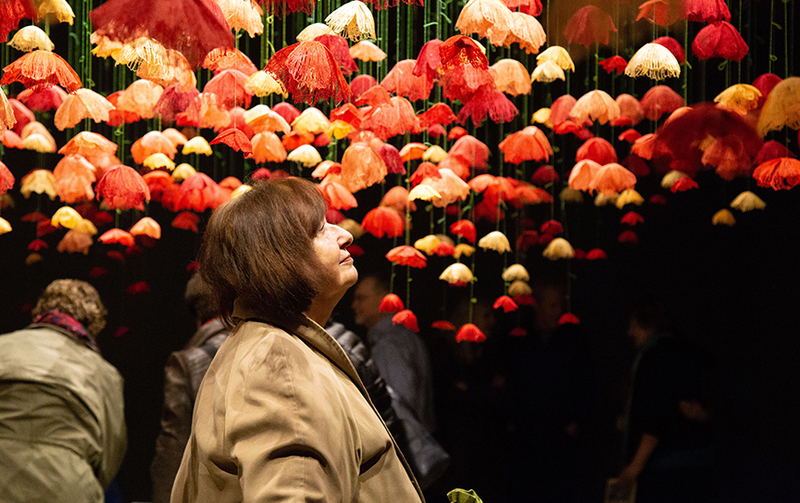 It has long been the symbol for sleep, healing, remembrance, and death; as well as, a particular favourite of many gardeners attracted to its colourful varieties and showy blossoms. 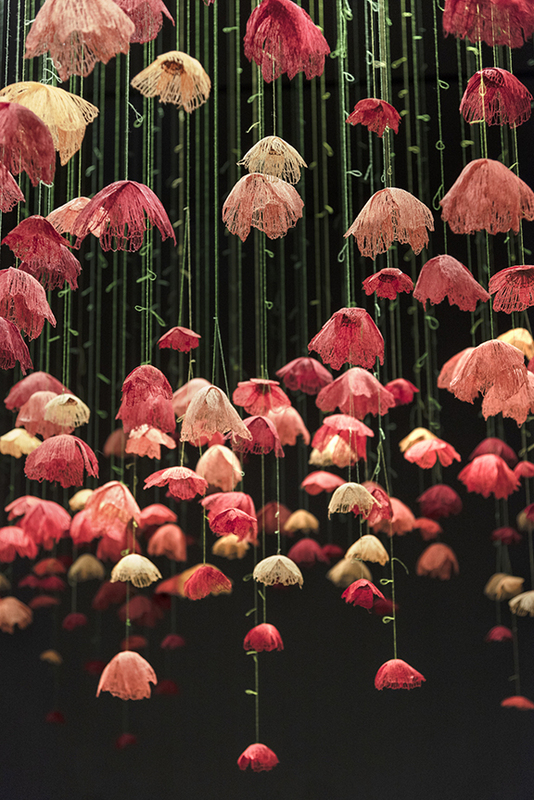 One can imagine cheerily frolicking through these poppies or pausing to commemorate a fallen warrior. 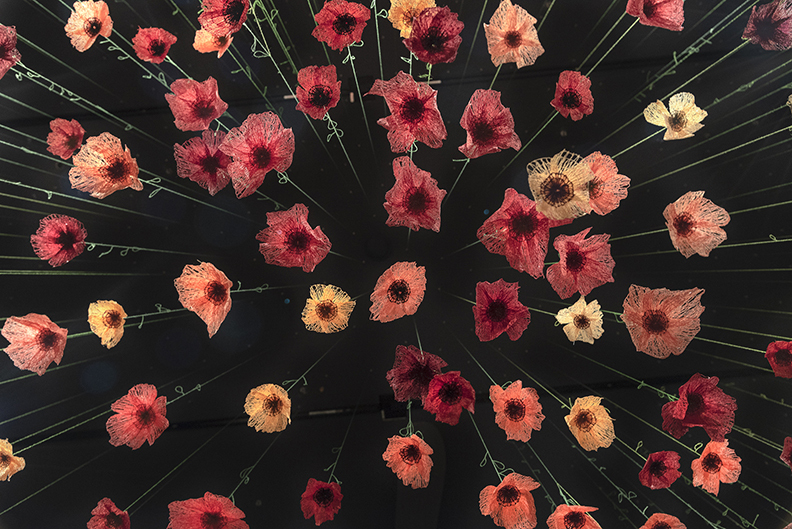 Perhaps, even lying down on the floor and looking up at this lush meadow will cause one to drift off into slumber – after all, poppies loomed large in the Land of Oz. And here you will find an interview by CBC Arts about the show and my process! Many thanks goes out to Gallery Stratford and specifically curator Angela Brayham for hosting the work in the gallery for the summer!